There are limited data on the impact of cesarean section delivery on HIV-1 infected women in Sub-Saharan Africa. The purpose of this study was to assess the effect of mode of delivery on HIV-1 disease progression and postpartum mortality in a Kenyan cohort. A prospective cohort study was conducted in Nairobi, Kenya from 2000–2005. We determined changes in CD4+ counts, HIV-1 RNA levels and mortality during the first year postpartum between HIV-1 infected women who underwent vaginal delivery (VD), non-scheduled cesarean section (NSCS) and scheduled cesarean section (SCS) and received short-course zidovudine. Loess curves and multivariate linear mixed effects models were used to compare longitudinal changes in maternal HIV-1 RNA and CD4+ counts by mode of delivery. Kaplan Meier curves, the log rank test, and Cox proportional hazards regression were used to assess difference in mortality. Of 501 women, 405 delivered by VD, 74 delivered by NSCS and 22 by SCS. Baseline characteristics were similar between the VD and NSCS groups. Baseline antenatal CD4+ counts were lowest and HIV-1 RNA levels highest in the NSCS group but HIV-1 RNA levels were similar between groups at delivery. The rate of decline in CD4+ cells and rate of increase in HIV-1 RNA did not differ between groups. 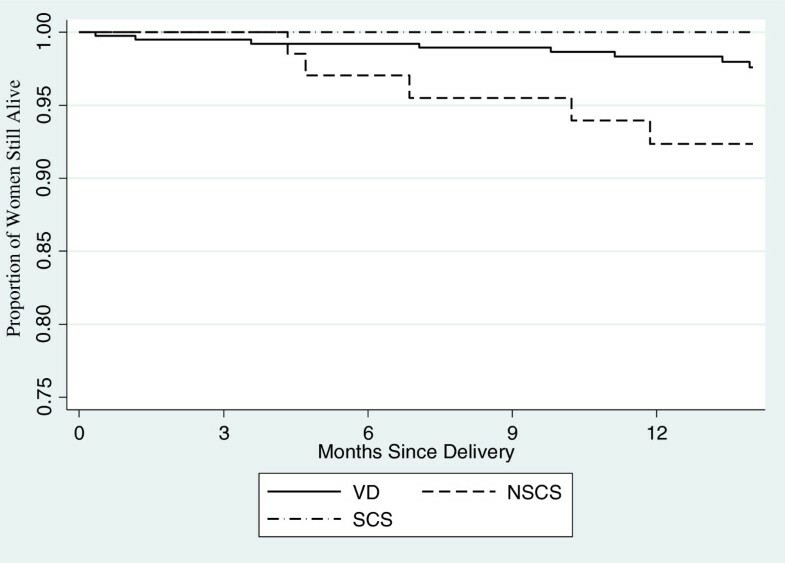 After adjusting for confounders, women who underwent NSCS had a 3.39-fold (95% CI 1.11, 10.35, P = 0.03) higher risk of mortality in the first year postpartum compared to women with VD. Non-scheduled cesarean section was an independent risk factor for postpartum mortality in HIV-1 positive Kenyan women. The cause of death was predominantly due to HIV-1 related infections, and not direct maternal deaths, however, this was not mirrored by differential changes in HIV-1 progression markers between the groups. Cesarean section prior to the onset of labor remains an effective intervention for the prevention of mother-to-child transmission (PMTCT) of HIV-1 among HIV-1 infected women receiving either no antiretrovirals (ARVs) or short-course ARVs with incompletely suppressed viral levels . However, surgical delivery may have detrimental effects, particularly among untreated or incompletely treated HIV-1 infected women in sub-Saharan Africa (SSA). In 2012 WHO, UNAIDS and UNICEF estimated that only 62% of the 1.4 to 1.7 million pregnant women living with HIV were receiving the most effective antiretroviral PMTCT regimen . Women with HIV-1 have higher rates of postpartum morbidity compared to uninfected women regardless of mode of delivery but morbidity is significantly increased with a cesarean delivery [3–5]. Moreover, postpartum morbidity appears to be highest in HIV-1 infected women undergoing an emergent or non-scheduled cesarean delivery . One study from Latin America and Caribbean found that postpartum morbidity was approximately 3-fold higher among women having non-scheduled cesarean section (NSCS) than that those with vaginal deliveries (VD). In the same study, morbidity among women with scheduled cesarean section (SCS) was similar to that of vaginal deliveries . The etiology of morbidity following cesarean delivery is multifactorial, and includes severe anemia [3, 8], fever [5, 6, 8], pneumonia , UTI , and endometritis [5, 8, 9]. There are conflicting data regarding the effect of mode of delivery on HIV-1 disease progression and mortality. Published studies examining the relationship between mode of delivery and disease progression have, thus far, been conducted in North American and European cohorts. The WITS study, conducted in a North American cohort, found no relationship between mode of delivery and subsequent HIV-1 disease progression . In contrast, the European Collaborative Study found less subsequent symptomatic HIV-1 disease among women who underwent a vaginal delivery compared to scheduled cesarean section . To date no study has evaluated mode of delivery as a cofactor for HIV-1 disease progression in sub-Saharan Africa, where rates of maternal morbidity and mortality are higher in general and treatment guidelines and access differ. The purpose of this study was to determine the effect of mode of delivery on HIV-1 disease progression as defined by decreases in CD4+ counts and increases in HIV-1 viral load and the effect on mortality in HIV-1 infected women during the first year postpartum. This study utilized data from a historical cohort study conducted in Nairobi, Kenya from October 2000 to June 2005. Women were recruited from 4 Nairobi City Council clinics when they presented for antenatal care prior to 28 weeks gestation. HIV-1 seropositive women were eligible to participate in the study if they planned to reside in Nairobi for 2 years after the birth of their infant. Written informed consent was obtained from all participants. Ethical approval was obtained from the Institutional Review Board of the University of Washington and Ethical Review Committee at the Kenya Medical Research Institute. The purpose of this sub-analysis was to determine the effect of mode of delivery on HIV-1 maternal disease progression as defined by decreases in CD4+ counts, increases in HIV-1 RNA levels and risk of death in the first year postpartum. The main aim of the larger study was to determine whether the presence of HIV-specific cytotoxic T lymphocyte (CTL) responses in children born to HIV-1 positive women were associated with subsequent protection from infection . Pregnant participants received routine antenatal care and a short-course zidovudine regimen, consisting of 300 mg orally twice a day from 36 weeks’ gestation until onset of labor and 300 mg every 3 hours from onset of labor until delivery, to reduce maternal to child transmission of HIV-1. This protocol was standard of care at the time of study . Clinical, immunologic and virologic characteristics were assessed at 32 weeks gestation as baseline. At delivery, blood was collected to measure HIV-1 RNA levels. Women were assessed at postpartum months 1, 3, 6, 9, and 12 for BMI, CD4+ T lymphocyte counts and HIV-1 RNA levels. Women received both multivitamins and iron for the first 6 months postpartum. Those with CD4+ cell counts <200 cells/uL received cotrimoxazole prophylaxis. When highly active antiretroviral therapy (ART) became more widely available in Kenya in 2003, women were referred to treatment programs and started on therapy. Women delivered at Kenyatta National Hospital with a certified nurse midwife or obstetrician. Decisions for mode of delivery were made at the discretion of KNH medical personnel and, during the study period, were not based on HIV-RNA levels. Cesarean sections performed prior to the onset of labor or rupture of membranes were defined as scheduled cesarean sections (SCS). A non-scheduled cesarean section (NSCS) was defined as one performed after the onset of labor or rupture of membranes. CD4+ cell counts were performed at the University of Nairobi using the FACScan flow cytometer (Becton Dickinson, Mountain View, California, USA). Plasma HIV-1 RNA levels were quantified by the use of transcription mediated amplification assay (Gen-Probe) at the Fred Hutchinson Cancer Research Center . Maternal baseline characteristics were compared by mode of delivery using the Student’s t-test for continuous variables and Pearson’s chi-square tests for categorical variables. The vaginal delivery (VD) group was the reference group for all comparisons. To describe and compare longitudinal changes in maternal HIV-1 RNA levels and CD4+ lymphocyte counts we used Loess curves and multivariate linear mixed effects models controlling for baseline levels of age, antenatal weight, partnership, antenatal CD4+, antenatal HIV-1 RNA, BMI and employment. Kaplan Meier curves, the log rank test, and Cox proportional hazards regression were used to determine if mode of delivery was associated with time to death during the first year postpartum. In all study analyses, P ≤ 0.05 was considered significant. All data were analyzed using STATA Software (StataCorp. 2011. Stata Statistical Software: Release 12. College Station, TX: StataCorp LP). Delivery information was available for 501 (94%) of the 535 participants in the cohort. Of these, 405 (81%) delivered vaginally and 22 (4%) by SCS (Table 1). Seventy-four women (15%) delivered by NSCS. The percentage of women delivered by SCS increased over the study duration, the majority occurring in the last two years when practice changes regarding SCS for PMTCT started in Kenya (Table 2). This, however, was not standard practice among all practitioners. aP value from a Student’s t-test for continuous variables and Pearson’s chi-square tests for categorical variables (statistical significance, α = 0.05). NSCS = non-scheduled cesarean section. SCS = scheduled cesarean section. The women who underwent vaginal deliveries and NSCS were similar in age, BMI, years of education, employment and number of prior pregnancies. However, those who delivered via NSCS were less likely to be in a stable relationship (P < 0.001). Women who delivered by SCS were generally older (P = 0.006), had higher BMI (P < 0.001) and were more likely to be employed (P = 0.01) than those who delivered vaginally. 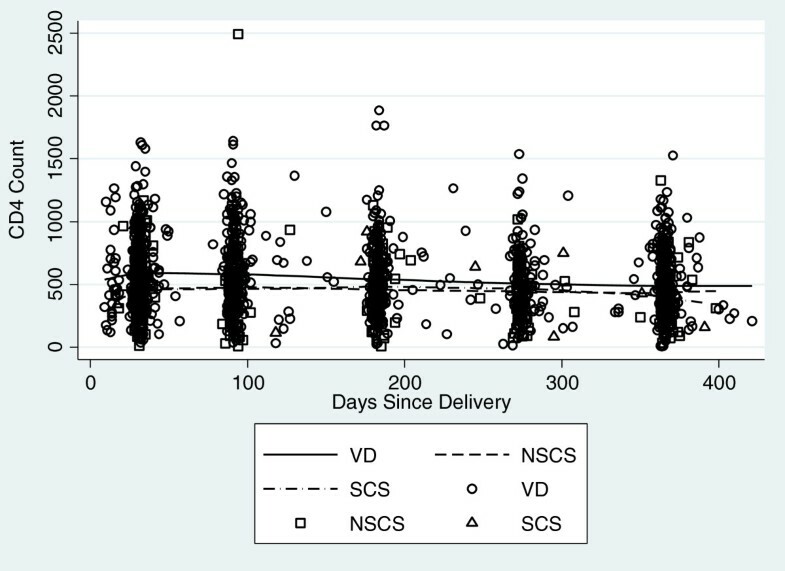 Women undergoing NSCS had significantly longer labors than those with a vaginal delivery (P = 0.04). However duration of rupture of membranes was similar between the two groups. The mean enrollment CD4+ cell count of the cohort (~32 weeks gestation) was 451 cells/mm3 and lower among the NSCS group compared to the vaginal delivery group (-67.7, P = 0.04). Mean HIV-1 RNA copy number was also significantly higher in those who underwent NSCS compared to the vaginal delivery group (4.8 versus 4.6 log10 copies per ml, P = 0.05). HIV-1 RNA levels were lower for all three groups at delivery compared to earlier in pregnancy, due to short-course zidovudine. Overall women received an average of 3 doses of zidovudine during labor but the greatest number x ¯ = 3.7 was received by the NSCS group. HIV-1 RNA levels did not differ between groups at delivery. The most common indication for NSCS was obstructed labor (47%). The data regarding indication for cesarean section were not complete for either the SCS or NSCS groups but this was particularly true for majority of SCS (68%) as indicated in Table 3. Postpartum CD4+ counts were available for 450 women; 365 (92%) of VD group, 74 (100%) of NSCS group and 17 (77%) of SCS group. The mean change per month for all women was -8.70 cells/ul (95% CI: -10.53, -6.87, P < 0.001). At the first month postpartum visit, women who delivered via NSCS had mean CD4+ counts 97.90 cell/ul lower than those with a VD (95% CI: -172.22, -23.57, P = 0.01) and women with a SCS at month one post partum had mean CD4+ counts 112.88-cells/ul lower than those with a VD (95% CI: -197.14, -28.61, P = 0.009). There was not a significant difference in change in CD4+ count over time for the NSCS group compared to the vaginal delivery group or for those with a SCS compared to a vaginal delivery. (Figure 1) CD4+ count comparisons between groups remained similar after controlling for potential confounding factors of age, antenatal weight, stable partnership, antenatal CD4+ count, antenatal HIV-1 RNA, antenatal BMI, and employment. CD4 + lymphocyte count over first year postpartum by mode of delivery. HIV-1 RNA measures were available for 475 women during the first year postpartum; 383 (95%) of VD group, 70 (95%) of NSCS group and 22 (100%) of SCS group. At one month postpartum women who delivered by NSCS had a mean viral load that was 0.34 log10 copies/ul higher than women with a VD (95% CI: 0.05, 0.63, P = 0.02). In contrast, women in the SCS group had a similar postpartum viral load as the VD group. 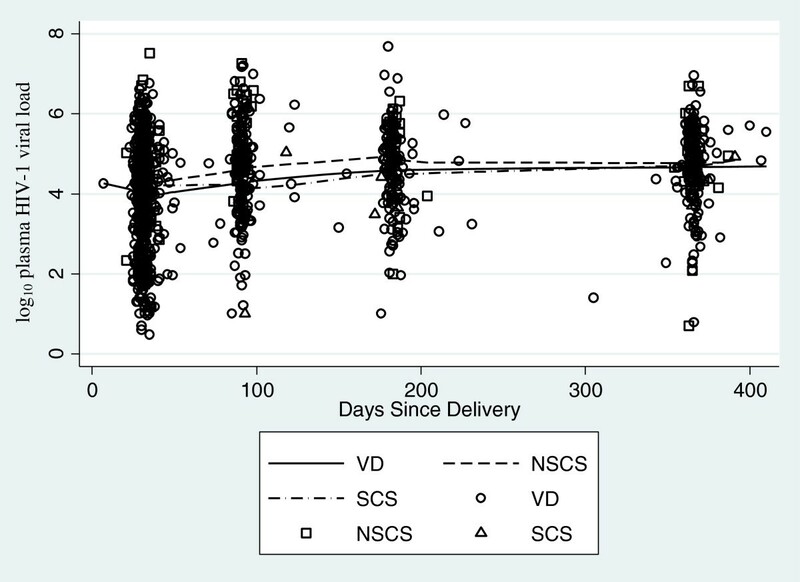 There was not a significant difference in viral load over time for women having a NSCS compared to VD or for those with a SCS versus VD (Figure 2). The mean change per month over the first year for all women was 0.06 log10 copies/ul (95% CI: 0.05, 0.07, P < 0.001). Results regarding viral load change over time were similar after controlling for potential confounding factors. HIV RNA copy number (log 10 ) over first year postpartum by mode of delivery. There were a total of 13 deaths in the first year postpartum, 8 in the VD group, 5 in the NSCS group, 0 in the SCS group. The 12-month post-delivery mortality risk was significantly higher for women having a NSCS compared to those with VD (P = 0.02) (Figure 3). Women in the NSCS group had a 3.39-fold increased risk of mortality versus VD (95% CI 1.11, 10.35, P = 0.03). Results were similar when controlling for potential confounding factors including age, antenatal weight, stable partnership, employment, length of labor, duration of rupture of membranes, baseline CD4+ count, baseline HIV-1 RNA, and baseline BMI. Proportion of women still alive over first year postpartum by mode of delivery. Causes of death in all groups were most often AIDS related (n = 11), including meningitis, bacterial pneumonia and tuberculosis (TB) (Table 4). There was one death from a pelvic abscess in the vaginal delivery group, which occurred 9 months after delivery. In the NSCS group, 3 of the 5 women who died did so from confirmed AIDS related illnesses. The other two deaths were from unknown causes though one woman had a CD4+ count less than 100 at the visit prior to her death and the other woman was reported to have Kaposi’s sarcoma at the time of her death. VD = vaginal delivery, NSCS = non-scheduled cesarean section. **Reported to have Kaposi’s sarcoma at time of death. In this study of HIV-1 infected women in Kenya, we found that mode of delivery was associated with mortality in the first year postpartum. The greatest risk of death was among women who underwent a non-scheduled cesarean section (NSCS) and no deaths occurred in the group of women who underwent a scheduled cesarean section (SCS). Baseline and postpartum differences in CD4+ lymphocyte count and HIV-1 RNA levels did not explain the 3-fold greater risk of mortality observed in the NSCS group. Although mortality was increased among women with NSCS, there were no significant differences in CD4+ cell count decline or HIV-1 RNA levels between the three mode of delivery groups over the 1-year postpartum period. Thus, although mode of delivery appeared to have an effect on mortality, the mortality difference between groups was not mirrored by similar effects of delivery mode on traditional markers of HIV-1 disease progression. Specifically, neither NSCS nor SCS were associated with a significant decrease in CD4+ counts or increase in HIV-1 RNA levels. The causes of death among the women were related to infections and not obstetrical causes, typically occurring after 3 months postpartum. The women who died did have advanced HIV-1 as measured by CD4+ <200, although this was true among deaths in all groups. The average maternal mortality rate (MMR) at Kenyatta National Hospital at the time of the study was approximately 300 per 100,000 live births  similar to the countrywide rate of 488 per 100,000 live births in 2008c . The most common causes of maternal deaths in Kenya continue to be maternal hemorrhage and infection, with HIV-1 being a significant indirect contributor. Previous studies have demonstrated conflicting results when examining the effects of mode of delivery on disease progression among HIV-1 infected women in US and European studies. The European Collaborative Study (ECS) of over 1200 women found more symptomatic HIV-1 among women who delivered by cesarean section than those who delivered vaginally . However, the Women and Infants Transmission Study (WITS) did not find a significant association between mode of delivery and disease progression, defined by a decrease in CD4% and HIV-1 RNA increase during the 18 months post delivery, or with clinical progression or death . These studies examined similar virologic, immunologic and mortality outcomes as our study. Although the WITS trial took place during a similar time period (1990–2004) as our study (2000–2005), the majority of women received HAART after 1996, which would be expected to attenuate impact of mode of delivery on HIV-1 progression. Currently in sub-Saharan Africa the estimated coverage of pregnant women living with HIV-1, receiving the most effective antiretroviral (ARV) regimens for prevention of mother to child transmission is 62% while approximately 10% continue to receive only single-dose nevirapine . Although advanced ARVs may greatly influence maternal outcomes, the lack of coverage continues to suggest that HIV-1 infected pregnant women will still be affected by their mode of delivery and that long labors followed by surgery may be deleterious for this population. When caring for HIV-1 positive women in labor, the risks of cesarean delivery after prolonged labor must be considered when making decisions about labor management. Other types of major surgery in HIV-1 infected individuals have been associated with higher rates of mortality than in HIV non-infected patients, even when infected individuals are on highly active antiretroviral therapy (HAART) . Chronic immune activation has been associated with HIV disease progression independent of cellular markers and previous studies have demonstrated that trauma and surgery stimulate immune activation [18–20]. Major abdominal surgery following labor likely increases immune activation to a greater extent than a vaginal delivery or planned cesarean section alone and thus immune activation may be a contributor to mortality in this cohort. Although this cannot be concluded from the available data it is worthy of exploration in future studies. There are several strengths and limitations to this study. The study was primarily designed to examine maternal HIV-1 disease progression, and included longitudinally collected immunologic and virologic markers of disease progression including CD4+ and HIV-1 RNA levels. Limitations of this study include the non-randomized design; we noted several differences at baseline between the three delivery groups and although these were included in multivariable models, it is possible that there was residual confounding. The study was also not originally designed to specifically examine mode of delivery as a factor in disease progression and we had incomplete delivery data. The number of women living with HIV-1 who are receiving HAART is currently higher than at the time of this cohort. HAART improves maternal outcomes and may influence the effect that mode of delivery plays on HIV-1 disease. Data regarding postpartum morbidity was also limited and made it difficult to assess its role in this cohort. In summary we found that NSCS appears to be a risk factor for HIV-1 infected women during the first year postpartum. These findings may influence postpartum surveillance in the non-scheduled cesarean section population but given the limitations of the data it is not possible to make recommendations regarding mode of delivery or a change in labor management. Future studies should include mode of delivery as a factor in models examining maternal deaths attributable to HIV and explore a design to prospectively examine HIV-1 infected women who undergo non-scheduled cesarean section. (1) Dr. Unger is supported by the Women’s Reproductive Health Research (WRHR) Career Development Award NICHD, K 12, HD001264-14. (2) Dr. John-Stewart is supported by NIH/NICHD 1 K24 HD054314-06 (PI, Grace John-Stewart) for her mentorship. (3) We thank the Kizazi working group (UW Global Center for Integrated Health of Women, Adolescents and Children (Global WACh)) for their analysis support during the preparation of this article. JU participated in the design of the study, the statistical analysis, interpretation of the data and prepared the manuscript. BR participated in the design of the study and the statistical analysis. PO participated in the design of the study, coordination and acquisition and interpretation of the data. CF participated in the study design and coordination and helped to draft the manuscript. DW participated in the design of the study and coordination. GJS conceived the study, participated in its design and coordination, interpretation of the data and helped to draft the manuscript. All authors read and approved the final manuscript.